Kimani: What inspired you to pen the Akokhan story? Fran: My Ghanaian background. One glaring difference between West Africa and East Africa is how local religious beliefs and rites are perceived. Traditional religions in Ghana and West Africa as a whole is culturally and accepted and respected, while this is some how frowned upon and referred to as voodoo, juju, witchcraft and other humiliating names in East Africa. I read the Superman, Batman and other super hero stories as a child. The power of the western superhero is derived from scientific sources and thus easily explainable. 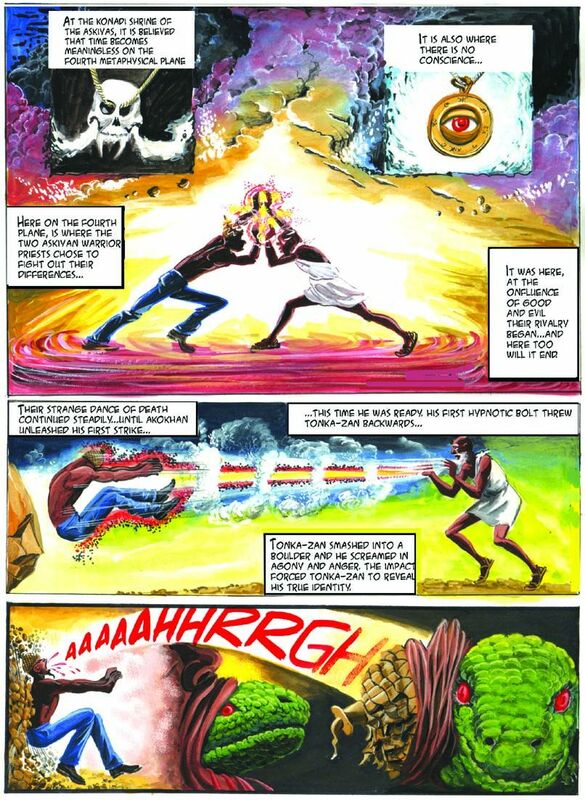 So I created Akokhan, an African superhero, whose power sources are unexplainable. Call it magic, but then when you breath life into fantasy, it stops being magic… bringing fantasy and African roots-religion together gave me Akokhan. Kimani: That is interesting. Take me through the journey of your life—-when & where were you born? Fran: I am a 20-year-old man with 36 years life experience. I was born on a Sunday, in Tarkwa, a mining town in Western Ghana (where my parents from the Ga tribe in Accra, the Ghanaian capital, were residing.) The third child among seven great sisters. As a child I did nothing but draw and play football, since all my sisters helped me out with household chores. Kimani: Where did you go to school? What are some of the memorable thoughts of your life while you were growing up? Fran: Primary School was at a place called Awaso also in western Ghana. Secondary school was O’Reilly Secondary, Accra then I attended Ghanatta Art college also in Accra, before joining the Medical School in Ghana as an assistant medical artist. Kimani: What did you want to do in life? Did you always want to be a cartoonist? Kimani: What prompted you to choose your career as a cartoonist? Fran: I didn’t choose to be one. I grew up loving fine art. I like to draw anything living or dead…I mean anything. Kimani: Please give me an outline of the body of your works- the things that you have done- both in Africa and internationally. Fran: That will be like giving you my CV, and it will be boring… My works have appeared in the major newspapers of Ghana and all the countries of the E. A. Federation. I have been featured several times on both BBC radio and the BBC Focus on Africa Magazine, Politiken (Denmark) Noticias (Mozambique) Helsinken Sanomat (Finland) etc., etc. I have also illustrated several educational books for most of the major publishing houses in East Africa, especially here in Kenya. Kimani: Which one was the most challenging and why? Which one do you think is the lousiest and why? Fran: Drawing for survival as a Scientific Illustrator at the International Centre for Insect Physiology and Ecology (ICIPE) in Nairobi, Kenya. Can you imagine an Artist working in the middle of all those Scientists!!! That was challenging, but I did it for three years! After all someone has to do it. Kimani: Where do you draw inspiration for your work? Who was your role model in the industry? Fran: I like watching Hollywood blockbuster, fantasy/horror/suspense movies. These and the follies of human nature inspire me. My role models were the artists whose work I hold in high esteem, Master Michael Angelo being one. He is my god! Kimani: That is profound. Why do you say that? Fran: That guy pushed art to its limits; he painted heaven and hell while hanging upside down; and he dared generations to emulate him. That’s the man I always want to be. Then there is comic artist Frank Frazetta, Harvey Kurtzman, John Buscema and the great Will Eisner…I love to see good, detailed art. Kimani: Please give me some highlights of: your happiest moments/memorable time; your trying/challenging time. Fran: Happiest moments? Several. Anytime I meet a fan of mine I get high. I am happy as long as I am with happy people. When I first met former Kenyan President Daniel arap Moi, I was happy because he was happily presenting me with a Best Cartoonist Award. I remember former Prime Minister Geingob of Namibia shaking my hand and at the same time asking me why I hated governments. I also remember the great time I had with comic artist Leif Packalen in Kemi, Finland, where I first fell in love with snow and the Arctic Comics Society. And I remember the first time I met Paul “Maddo” Kelemba and told him his artwork and style was “just not in Nairobi”. And still, I remember the first time I met Caroline, the girl who later became my wife. Kimani: What are the other things that you like doing when you are not working? What are your hobbies etc.? Fran: I like hanging out with the right boys and girls at weekends. I love a variety of music genres, I boast of a collection that will make any FM station envious. I also like the English Premiership, Manchester United and Chelsea. I detest smokers of cigarettes and other things. Fran: Look at the storyline of Akokhan. It has humour that turns into horror just as your laughter starts to pick up. I drew it as graphically as I could, like a print version of a movie. It is just another story of good against evil, and yet it is so different from “good cowboys shooting down evil Indians.” During one of my exhibitions at the French Cultural Center Nairobi, I had pastors and church people ask me about the source of my creation and I loved it because if I could tickle them, then I had made my point… Akokhan is more than a comic story. Kimani: What are the “Konadi Chronicles” that seem to be the driving force behind the age-old battle between good and evil captured in the battles between Akokhan and Tonkazan? Fran: Like any other religious set up, there are those few selected “Popes” who are entrusted with the secrets of their Spiritual order. The verse from the Konadi Chronicles is fiction, written by me to introduce the reader to Akokhan… You know what? I love those lines. I might even write a whole book based on that verse. Kimani: The phrase “where grass has grown, grass will grow” has been repeated over and over in the Akokhan story. What is the significance of this phrase? Fran: It simply means Akokhan is invincible… More or less like the infinite theory. It only needs rain to fall on a ground where grass has grown… and grass will grow. Hi Kimani, Did you managed to get the old copies of akokhan. I really need it. Hi, Unfortunately not. Youcould talk to the Standard newspapers in Kenya. kameni this is my number +233247599334.henr odoi you friends son,mind you a hero will produce a hero,so expect something different this time,where grass has grown,grass will not stop growing there. Am so happy to hear that. I am looking forward to hearing from you. I would also like to see and get the old copies. Thanks. how can i get copies of Akokhan (full story). how can i get these books because i have always loved it but could not follow it, thus now i want the full story. would be grateful for any help. Call EAEP. They published him sometimes back. call these guys to inquire on how you can get a copy of the Konadi Chronicles, where the Eyeof Koffi Larteh reins, where grass has grown, grass will grow. don Alasto i wish to inform you the sudden death of my father[frank odoi]which occurred, almost three months ago through a motor accident in Nairobi,that is the reason why they have stop printing it for sometime,but i can provide you for you to read more through his old copies about akokhan. Yes, I would love that very much. In fact, I want from the start till where ever you have available. So how am I going to get it. This is your boy Henry Odoi, The son of Frank Odoi, kameni work done successful, but now we are waiting for the film acting, This is what my Dad told me about you so don’t run away from it. Try your possible best to communicate with me through henryodoi56@gmail.com. Hi Henry, thanks for your message. Check your email. 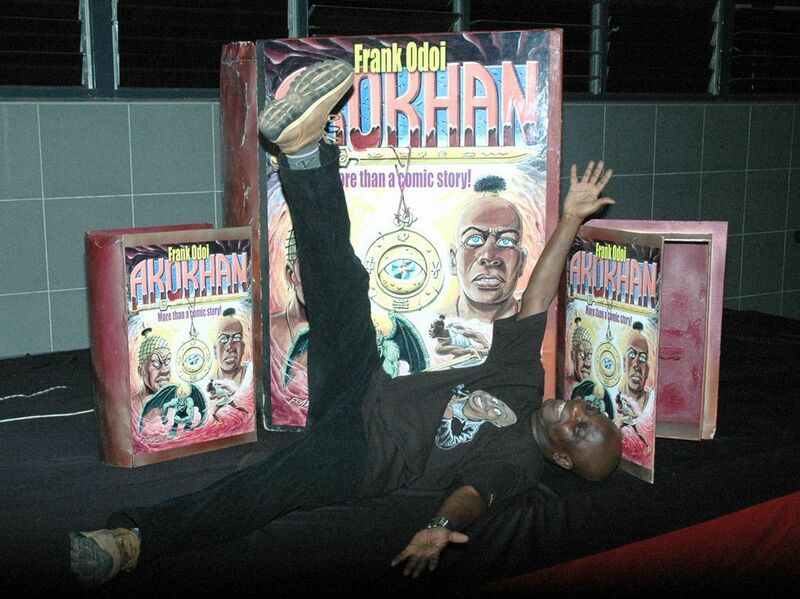 THERE WILL ONLY BE ONE AND ONLY FRAN ODOI-RIP-growing up in early 2000s was captivated and amazed by AKOKHAN,once thought was myth.will never forget the memories. great work, you styled the fiction to reality may you Rest IN Peace. 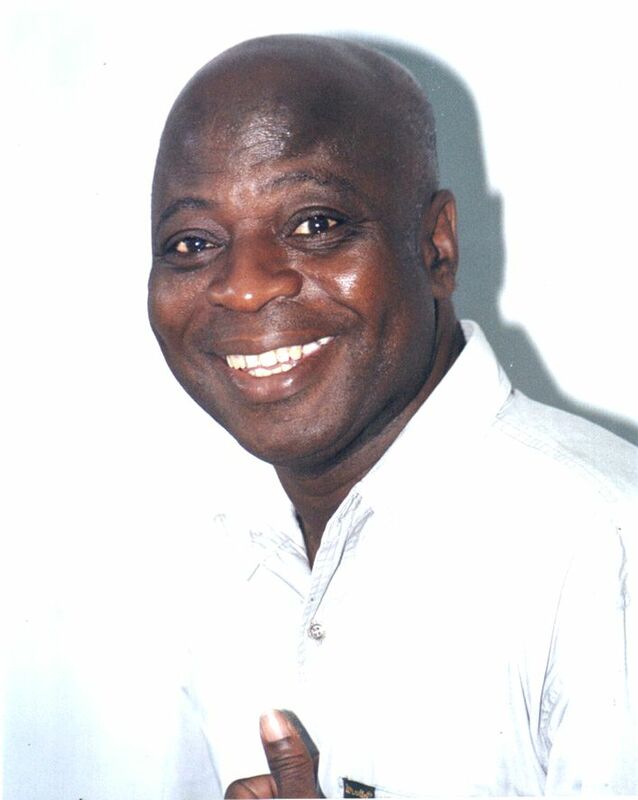 HENRY ODOI IS MY NAME,I THANK FRANK ALOT FOR EDUCATING THE PEOPLE OF AFRICA ABOUT THEIR CULTURE FOR EXAMPLE GHANA[LA] TO PRECRIBE. Hey ,what about Ajepoha.You remember Honakami-the Jugment trial where Akokhan faced all of his past villians,I know Tonka Zhan was the the most Challenging one but Ajepoha ,this guy was a perfect match to the Askia Priest-Akokhan.Thanks Frank this is a classic.I followed Akokhan since 1996. Hey Peter, You have been a true follower of Akhokhan. Actually Ajepoha is currently running in the Saturday Star. The episodes have been featured for the last four weeks or so. Follow it here too. Frank is a real genius on this. Yeah very true. I continue to be fascinated by this work or art. My favourite character is the old man Akokhan, i like the eye too. The battles that those two (Akokhan and Tonkazan) wage is also the battle we engage in daily– the good versus evil, tis a daily battle since “where grass has grown, grass will grow.” powerful statement. Hi Kimani.I love this series,if only it could be developed into a book.Is it there ? Hey Peter, there is a book that Frank did with East African Education Publishers. It is a nice publication. As a follower of the series, this would be a nice addition to your library. for the the Konadi Chronicles series once again. Peter, call these guys to inquire on how you can get a copy of the Konadi Chronicles, where the Eyeof Koffi Larteh reins, where grass has grown, grass will grow. Frank odoi is the biggest heros of all. i started following his story akokhan back in 2001 when i was still a kid. the power of imagination that is printed in my mind is never diminishing and he made me always wanting to produce a motion picture movie or TV series out of this fascinating story of all times. i changed my career to animation and visual effect so that one day ill produce this story. thank you frank cause you are really true inspiration of my current career and i hope that one day ill be able to animate the entire super hero story. My favorite character used to be Tonka zan and the best moment is when he raise konadi kodikali from death to help him face akokhan. can i please get the older version of your story of 2001 and 2002.ill be very glad . icant find it in any book nor is not easy to get collection of 2001 saturday nation papers now. if possible please let me know! i also have sketches of tonka zan konadi and akokhan in my art book. Hey Victor, thanks for the comments and love of Akokhan. Like you I love the series. He has been running the series in the Star newspaper– every Saturday and I have been following this as well. I will make sure Frank sees your comments and get back to you. Thanks. thanks kim ill be glad to chat with him.ya great. hi dad, how u doing? it has been quite a long time hope all is well? Like most people, i find the Akhokan story fascinating,i followed the story when he used to write for Saturday Nation and now at Nairobi star.By the way,where can i find the book’Akhokan’? All the bookshops in Nairobi,don’t have it.I would like to know what became of,Jeki the scorpion,and Ankobra the bull. Thank you very much Muchuki. I have followed it for that long as well. I will inquire from the publishers– East African Education Publishers and will email you their response. Thanks once more. special thanks to my dad frank odoi , for bringing out the history of our ancestors which is the truth of africa.where grass asgrown ,grass go growwwwwww. Hey Henry, I have followed Frank’s work for a very long time and am a huge fun of Akokhan. I love that phrase “where grass has grown, grass will grow.” Am currently reading his Golgoti series and will feature it here too. it is time to fix your hands on your head,thank you. KImani did you forget to signpost people on Fran’s products and his contact deatails or it was not allowed? ?